///^\\\ = Martin's Fulcrum Musings: Can the Enterprise Strike Back? Can the Enterprise Strike Back? Most people have written-off Research in Motion (RIM) and their Blackberry platform. But then most people take a consumer’s perspective in making that assessment. RIM is making a play to its traditional strength – security. But it is considering security for both enterprises and consumers. Security is a powerful draw for enterprises, but not for consumers in my experience. 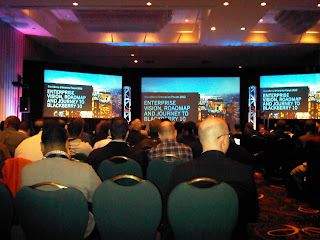 I got to think about this when I attended a RIM Blackberry event in Toronto yesterday – the BlackBerry Enterprise Forum 2012. Clearly aimed to the enterprise, as you’d expect, at least half of the attendees were from IT departments. And I estimate 95% were male! This is interesting because the day before I attended a webinar on electronic signatures and all of the questions came from women. In my experience women dominate the business side of records and document management efforts in enterprises. The under-representation of women should have set off alarms. RIM is responding to the Bring Your Own Device (BYOD) trend in many organizations. First they provide tools under the BlackBerry Mobile Fusion banner to help IT departments register and manage Android and iOS (Apple) devices, in addition to RIM devices. This approach recognizes that staff, and most significantly, senior executives, are bringing such devices to work and demanding that they be connected to enterprise resources, starting with email. But it will do nothing to reverse the trend of people investing in Android and iOS devices personally. RIM hopes that BlackBerry Balance (video), a key feature that is further built-out in the forthcoming BB10 release, might encourage staff to pick a BlackBerry as their personal device. There is a complete separation of personal and work information on a device into two workspaces. In BB10 users get a unified interface, but are unable to copy information from work to personal areas. Certainly IT departments will like the added security, and this might let them push back on the deployment of non-Blackberry devices, but there is less ‘in it’ for staff. Perhaps the best feature is that IT can delete all work information on a device without touching personal information. I could have benefited from a better separation between work and personal information on my devices earlier this year (blog post). But in the end, for most people, look for the shiniest, coolest, most fashionable device of the moment, and don't consider their possible future dismissal. RIM knows this and acknowledged it by highlighting the hot features of the new camera in BB10 devices and the new intelligent keyboard. But I doubt it will be enough. I was left with the feeling that RIM is trying to do too much in too many arenas. The breadth of their effort was presented as strength: “No other company has as comprehensive a platform as BlackBerry,” said Andrew McLeod, RIM's managing director of Canada operations and event chair. RIM offers operating systems, enterprise security and device management, cloud services, and handheld devices, while trying to appeal to consumers and enterprises, and also feeding a developer and partner network across all of these. Apple, Microsoft and Google each only do some of this, and they are able to devote far more resources than a diminished RIM. For me, in a fast-paced market, you can only win when you focus sharply. A fully integrated offering wins when there is enough time to complete it, which requires competitors make few changes and that there are no disruptive market entries. That is not the current climate in the mobile device world. For me the enterprise and cloud security story was the most compelling, and perhaps it will be the ultimate, surviving asset. The excitement and enthusiasm of the RIM staff at the event was palpable. They are believers and are being tested in ‘the fire.’ I tried to be supportive – I took my BlackBerry and had my Kindle in my pocket (to read on the subway), but refrained from taking my iPad. But even at such an event for hard-core supporters, I saw a number of iPhones in use. I still feel like RIM is missing the mark in terms of why people started to turn away. Security was never the reason. Keyboards were never the reason. Cameras help a bit, but there were a number of other reasons that brought them down, apart from what would just naturally be a more competitive environment as more devices came onto the scene. RIM missed the mark on quite a few things, and it will be interesting to see where BB10 takes them. Here's my take on what their top "99 problems" (and security ain't one): the "coolness" factor - more modern branding and cleanliness in design from competitors; the "elitist" factor - RIM became too big for its britches and turned into a bit of a poor sport publically, plus they didn't heed customer demands for apps; and the "turtle" factor - slow browsing and time to market (tablets) looses the race every time. I support RIM because it's a Canadian company, and one that will bring down my city (Waterloo) should this decline continue, but even I'm thinking of cheating on RIM these days. Even if the product improves, I'm not sure that the brand isn't irreparably damaged.